As my team mate Benny Adauto and his wife Shari drive the SooMobile over 2,000 miles across the US from Diamond Bar to Lynchburg, we are making the final flight arrangements and last minute touches for our trip to the 2012 Jack Daniels invitational Championship. Besides the meat and sauce preparation, there’s the dessert category, sauce category, Cook’s Choice entry where US teams turn in a favorite state dish, and Happiest home in the Hollow contest where teams decorate their tent sites showing off their state heritage or special theme. Since it is our first trip to the Jack, we wanted to take in as much as we can and with a ten person SYD team, we will be in full force. Harry invited as many of his 15+ assistant cooks the past 4 years who could make this prestigious event. Donna has been working diligently on decorating our tents. Our theme will be Hippiest home in the Hollow. There will be dozens of vintage Bill Graham posters from Fillmore west, red delicious apples, black lights, Jimmy Hendrix glow in the dark poster, lava lamps, door beads, Woodstock music, and incense for that extra special atmosphere. 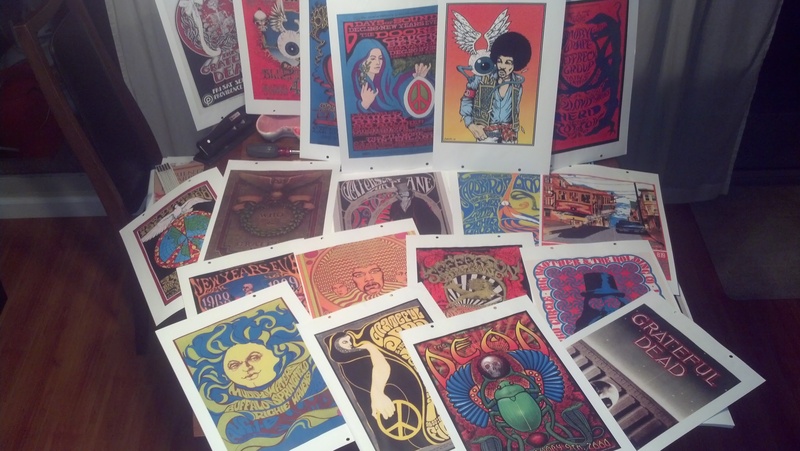 Posters from the Woodstock era! Marty Leach of AMLWoodArt.com made ultra special custom wooden handles for Harry’s new pimped out WSM. 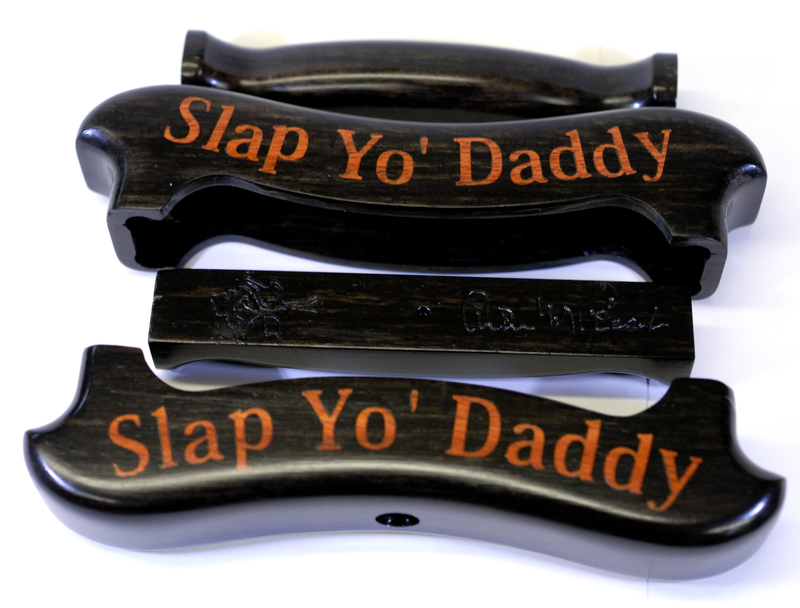 These handles are made from Gaboon Ebony which is the darkest wood on the planet (used for piano keys) with the Slap Yo’ Daddy inlay in Bubinga wood, a reddish orange African wood. They were designed to match the colors for the WSM being displayed for the first time at the Jack. Many thanks to Marty Leach for these amazing special order handles. Janet and Hank of Turbo Screen Printing made our giveaway SYD Jack black tees and matching tote bags. We will be handing them out to the public for a minimum donation of $1.00 to benefit Operation Homefront which assists our troops, their families, and veterans. Many thanks for printing our tees and totes. 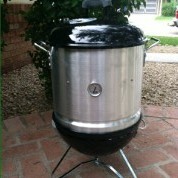 Kris Almquist of Phoenix (480-813-2288) also made a special baby WSM for Harry to use at the Jack. 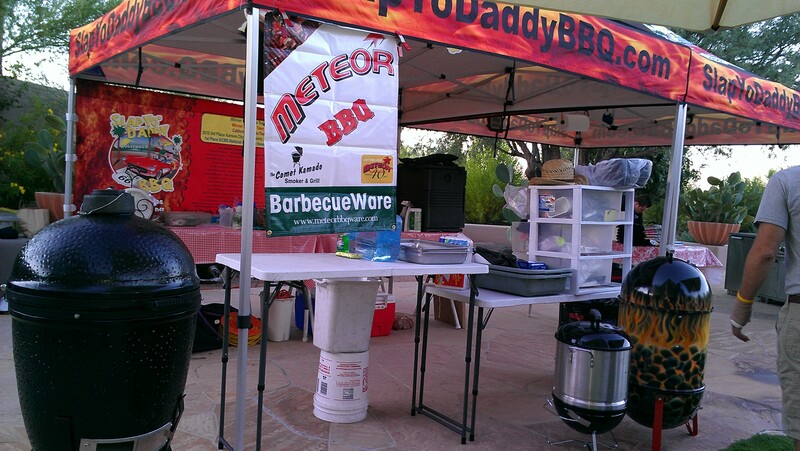 This is a modified Weber Smokey Joe and this new pit will be used to cook the white meat chicken required for the Jack chicken turn-in box. 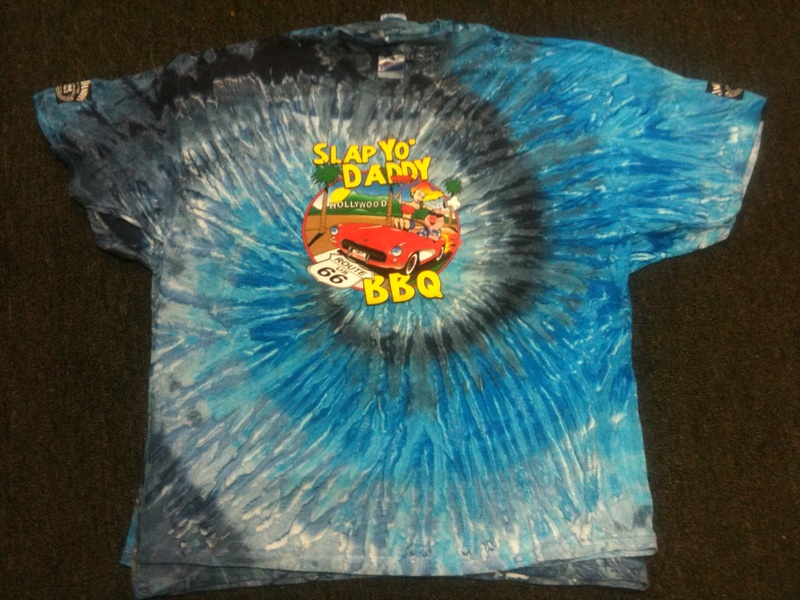 With our new SYD tie dye t-shirts courtesy of Turbo Screen Printing, a California state flag, and our SYD banner, we will do our best to represent the state, along with Pam/Scott Hares of Too Ashamed to Name from San Jose, CA. Lynchburg, here we come! Safe travels to you and your team. May your boxes land on a table of good judges (mine too). Give em Hell Harry! Peggy and I will be there in spirit and will be your biggest fans. 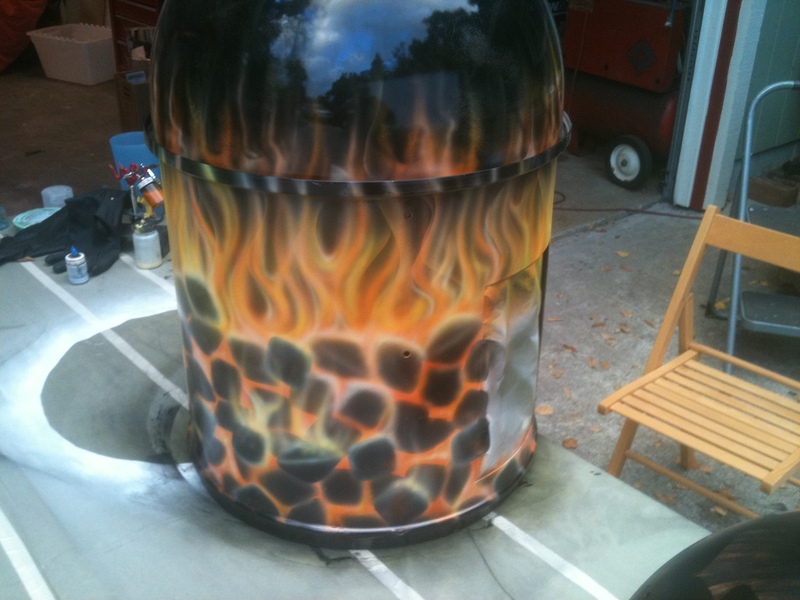 Your decorations and custom WSM’s are awesome. Good Luck. 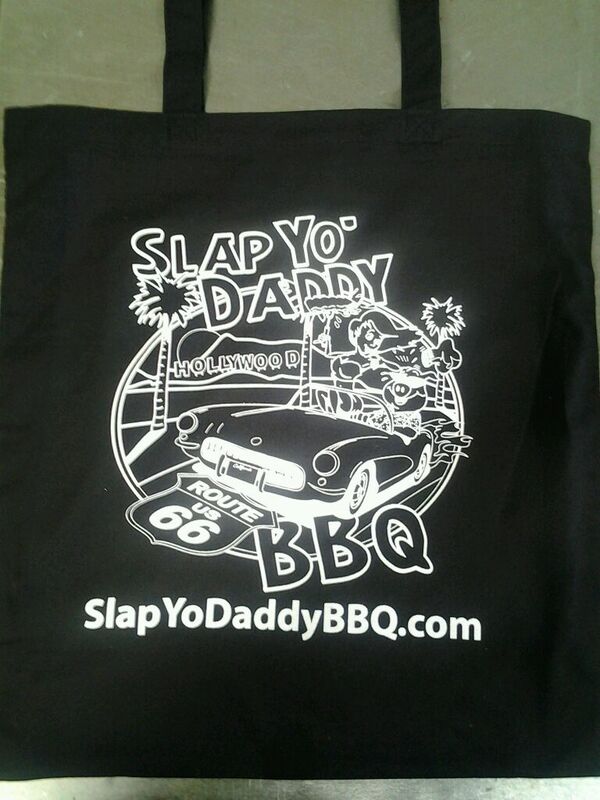 After attending your class I feel part of the Slap Yo Daddy family so on behalf of all of your students…Good Luck to you and your team (our team)!